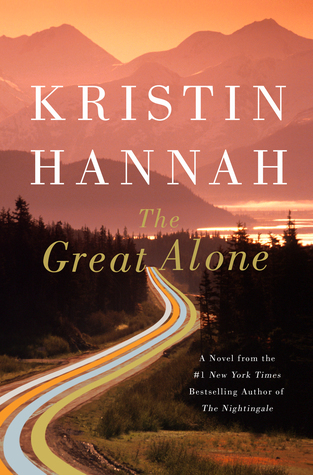 As one of 2018’s most anticipated books, Kristin Hannah’s The Great Alone had an enormous amount of buzz and early praise to live up to. It also had big shoes to fill in the wake of the much beloved The Nightingale. Fortunately for Hannah fans, it’s safe to say that she has met and even exceeded all expectations with her latest read. On the surface, The Great Alone is a story about thirteen-year-old Leni Allbright, a girl who is at once innocent and wise beyond her years, as she has watched her Vietnam veteran father face his demons for as long as she can remember. It is a story about a family who, in 1974, a time of turmoil and change, decides to moves to the untamed wilderness of Alaska to get off the grid, to save themselves, to survive the wild, and leave behind the past to embrace an unknown future. But The Great Alone is also a multi-layered love story. There’s the passionate, burning romance between Leni’s parents, Cora and Ernt, the one that Cora believes is simply misunderstood by the outside world—and what happens to a flame that burns that hot when crisis and controversy strike and the real world seeps in. For Leni and her Alaskan friend Matthew, two of the only teenagers in a desolate and often terrifying landscape, love seems likely. But it is what happens after those innocent teenaged days—sharing books and swapping stories, sneaking out and falling in love under a vivid Alaskan sky—that is the real story, the part of Hannah’s novel that is the rawest, the truest and, in the end, perhaps even the most complex. Most notably of all is a type of love that is often even less black and white than romantic love. It is the love that Leni has for her parents, the pull she feels toward them and the responsibility she takes for them when they aren’t taking responsibility for themselves. As Leni’s mother Cora is pulled deeper and deeper into an unhealthy relationship with her father Ernt, Leni is tested in ways that no child should be and asked to make choices that no parent would ever want his or her child to have to make. Though it is her parents who should be protecting her, in Leni’s Alaska, that role often seems to reverse. That said, all those decisions might have simply been practice for when Leni, at far too young an age, is faced with the most difficult choice she will likely ever make. In so many ways, Alaska is the perfect backdrop for this story because it mirrors Laney’s own life so well. At times, it is so beautiful, so perfect, so right that it absolutely takes your breath away. But the thing about Alaska—and life—is that it will turn on you in a moment. As the locals say, in Alaska you can make one mistake. The second will probably kill you. A tale of second chances, hard endings, unlikely beginnings and, ultimately, redemption, Kristin Hannah’s The Great Alone is a story that will live on in the hearts and minds of readers long after its last page, and one that imparts lessons that readers will come back to again and again. Love is as complicated as the great outdoors, life is as precious and precarious as Alaskan sunlight during winter and, perhaps most importantly of all, sometimes you have to get lost to truly find yourself.